Binmaster brings precision and reliability to measuring and monitoring volume and tonnage in free standing stockpiles. Replace outdated guesswork, inventory write-offs, and bad valuations while saving hours of time and hassle. 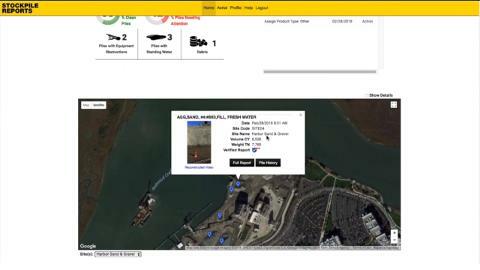 Stockpile Reports automates pile measurement using pictures from a cell phone, drone, plane, or fixed camera. Data is accessed and shared on a web portal – completely digitizing material management. Dashboards populated with photographs, site statistics, and materials report vital information on the volume, tonnage, and condition risks for each pile. This SaaS subscription allows users to track pile inventory on a monthly, weekly, or even daily basis. This simple online service requires no special hardware and is scalable from 5 to more than 500 piles for one site or an entire corporation.